Posted by dutchgrub	on Friday, June 19, 2009 at 15:08. 4 Comments. June is food festival month in Amsterdam. 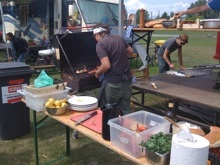 So here are some impressions from the Rolling Kitchens Festival on 6 June at the Westergasfabriek. There was a good variety of food and the vehicles and stalls were put together creatively. There were juices and shakes, sausages and french fries, freshly made pizza and red wine, a few barbecues including a lobster one, cocktails and sangria, crêpes and galettes with cider, and even two bands playing! We first had some pizza and then sat down for a while with a directly imported bottle of cider and two nutella crêpes. It was fun to watch the mixed crowd, young and old, local and tourists, stroll the festival and pick their favorite rolling kitchen. The only issue was missing recycling containers – quite inexcusable for a food festival that is part of the sustainable Amsterdam event! Filed under amsterdam, drinks, festivals, food, wine. 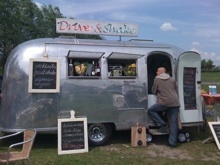 rolling kitchens festival amsterdam - impressions - at dutchgrub | Home Improvement blog. Unfortunately, I didn’t find any lobster at this year’s event. Great point on the recycling though – I didn’t even notice, but I think this year too it was only garbage bags. Cool pictures! Thank for having shared. We couldn’t make Rolling Kitchens this years, but I’m glad to see that it’s coming back better than before. Too many food festivals come and go, and I particularly liked this one for all those quirky food stalls. Looks like a lot of last year’s attractions come back. And lots of new stalls, too!